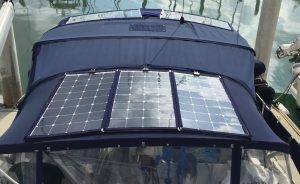 2014 Solbian Installation on a Catalina 390 in Ontario. The customer didn’t need to plug into shore power all summer! I wanted to relay to you how well our installation of the solar panels you supplied worked out. Sound Boat Works (Parry Sound, ON) did an excellent job on the installation of 2 x SP112Q high output Solbian panels with controllers. The panels are mounted on the bimini and are out of the way. You don’t really see them unless you know they are there. We more or less followed the information on your website from the Catalina 34 testimonial and the installation guidelines provided. On our cruise to the North Channel area of Lake Huron this summer I didn’t have to worry about running the engine or plugging in to shore power. 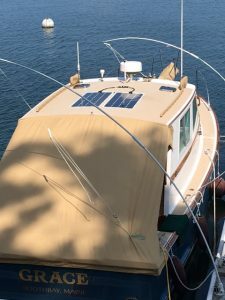 In fact we did not plug into shore power once this summer, plus we were able to run the fridge (and everything else) in our Catalina 390 without a second thought. Since the boat is kept on a mooring, this is a big improvement. Thank you very much for your excellent support for this project. I’m absolutely amazed how many amps these panels produce. Yesterday they made 186 amps! The best I ever did with my old panels was 138… And that was in June. I’m finding I have to shut off shore power and use my inverter to get the batteries low enough to truly see the output of these panels. Last year in March I averaged 82ah per day. Since I replaced the 125s and changed the 80s for 100s, I’ve averaged 140ah per day the last 10 days of March. I know there are other factors such as cloud cover… But I really am seeing a much greater output than the additional 10% watt potential that I added when replacing the 80s. Suddenly, I’m thinking of new ways to use the energy I’m able to produce… Not constantly worried about my ever decreasing battery charge! Thanks again for your help… We’re complete Solbian and OceanPlanet Energy satisfied customers. 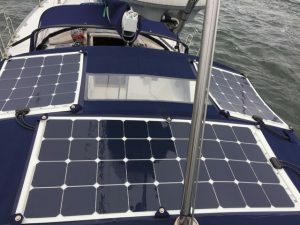 I wanted to let you and your team know how pleased I am with the new solar power system that we installed on my 34′ Wilbur power boat. Each component of the system we purchased from you has worked flawlessly. And it is more efficient than expected, both as to the solar amps input and the output from the inverter. With your help, I purchased 2 Solbian 125w solar panels, and the following Victron equipment: a 3000w Phoenix inverter, a 100/50 MPPT solar charge controller, a BMV-700 battery monitor and a Color Control GX. The system charges 2 Lifeline 8D AGM batteries. 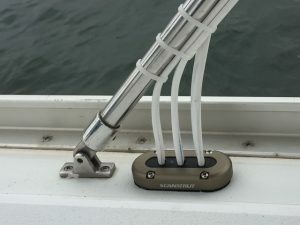 We also installed a Redport Halo wifi extender to allow the Color Control data to be remotely accessed over the internet, and connected a fresh water tank monitor through the boat’s NMEA backbone to the Color Control. While the solar panels are rated to produce a maximum of 5.7 amps each, we were getting a total of 15+ amps from them in the middle of a sunny day. And the efficency of the inverter allows me to power a 1000w water heater using only 2/3rds of the amp hours we calculated before the installation. The Color Control is intuitive to operate and provides an easy to read detailed status report on each of the components attached to the system both in text and color graphic format. It also allows me to operate the inverter which is located in a hard to reach place in the lazerette. Even the installer you recommended was impressed with how the system performed. Finally, the solar panels are so thin that they look like they are recessed in the hardtop. Even my wife liked they way they looked. In short, I’m glad we didn’t wait any longer to install the system. Having the new, quiet and free energy on the boat will greatly improve our cruising. Thanks again for your invaluable help. Your willingness to support me after the sale, and your quick responses, helped someone with little knowledge of electrical make his first install run smoothly. In the short time I’ve owned and been working on my boat, this job involved, by far, the least foul language. 🙂 Things seem to be running as spec’d, and I’ll produce excess energy on most days at anchor.